Even though many Thais speak English very well, there are times when a mispronunciation, in all innocence, brings howls of laughter. I was asked once whether we needed any calendar for the chicken tonight. It should have been coriander. On a recent visit to Baan Jing Jai, Piantah asked if Pattaya Sports Club could provide sufficient funds to purchase a new ‘fish’ as the old one had been repaired so many times, it was on its last legs. I did not know that fish had legs and the expression on Nigel’s face said the same thing. What fish? Here is the ‘fish’. Sorry the fridge. We were shown to the kitchen where the offending ‘fish’ stood, except that it was a fridge. 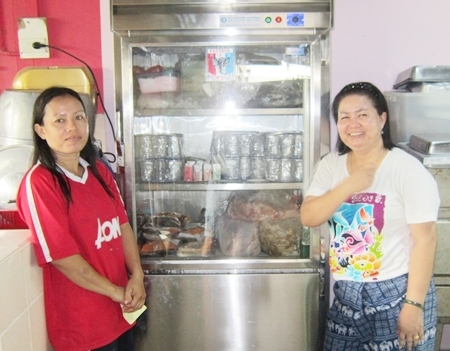 Pattaya Sports Club readily agreed and funds were set aside to buy a commercial fridge with a glass door. 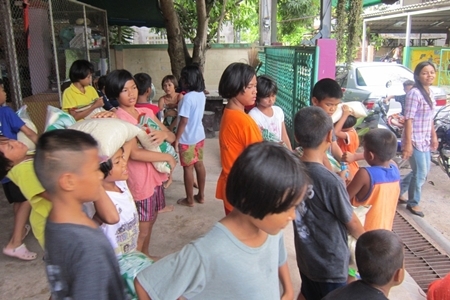 The supplier wanted to help the orphanage and gave us a reasonable discount which was used to buy some rice for the children. The children use different techniques to unload the rice. Piantah was very happy with the new ‘fish’, especially as the doors locked thereby keeping whatever was inside away from tiny, exploring hands. The door would have been opened many times during the day thereby using more electricity. That problem has now been resolved. 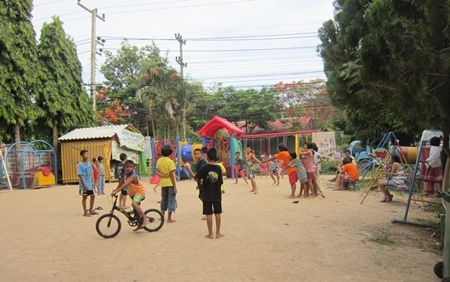 All this happened on Visakha Bucha Day and during the course of the day, the children, having a day off from school, had demolished two tubs of ice cream, were just about to tuck into some noodles and were having a wonderful day. Although living in cramped conditions, they are happy being part of a big family and the smiles on their faces says it all thanks to the dedication of Piantah and her staff.